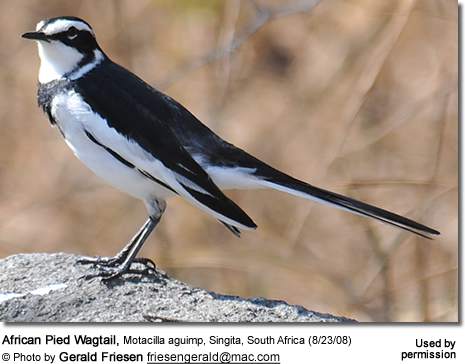 The African Pied Wagtails (Motacilla aguimp) are black and white plumaged birds found in Africa. These insect-eating birds occur naturally in the following countries: Angola, Benin, Botswana, Burkina Faso, Burundi, Cameroon, Central African Republic, Chad, Republic of the Congo, Democratic Republic of the Congo, Ivory Coast, Egypt, Equatorial Guinea, Eritrea, Ethiopia, Gabon, Gambia, Ghana, Guinea, Guinea-Bissau, Kenya, Lesotho, Liberia, Malawi, Mali, Mauritania, Mozambique, Namibia, Niger, Nigeria, Rwanda, Senegal, Sierra Leone, Somalia, South Africa, Sudan, Swaziland, Tanzania, Togo, Uganda, Zambia and Zimbabwe. They inhabit subtropical or tropical seasonally wet or flooded lowland grassland, rivers, and, occasionally, freshwater marshes.